Management reports should be issued to give a clearer picture of where your business is at a particular time of the year. The reports should be timely, relevant and easy to understand. All too often management reporting systems evolve into a complicated web of confusing paper and data that rather than improving your business’ bottom line, impair it by draining resources employed in compiling and analysing all the data that is being issued. If you find that you have too many management reports to process or that your staff are ‘bogged’ down in processing reports, then maybe it is time to re-configure your reporting environment. The critical aspects in improved management reporting are proper planning and sourcing an integrated software solution that can streamline your business’ reporting requirements and cut unnecessary duplication from your workplace. 1. Decide what you need to be reported. What are the crucial things that you need to know? Where are your current blind spots and bottlenecks? Who else in your organisation needs to see this information and how quickly can it be produced? How detailed does it need to be? How far do you need to be able to drill down to identify areas for improvement? 2. Set some bench mark targets. There’s an old saying that says if you aim at nothing you usually hit it. Keeping targets and benchmarks visible within your reporting framework will put your goals and targets front of mind when reports are issued and viewed. With this in mind, it is essential that reports should measure performance against your organisation’s realistic targets and objectives. Performance against target should be easy to read and understand. 3. 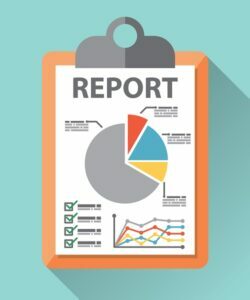 What purpose does the report serve? What will it identify? What will it track? Who needs to see the report? Importantly – can another report perform the same function? 4. Does your reporting system give the complete picture of your organisation’s health? A fully integrated system that can monitor stock, cash flow, staff, customer service indicators, as well as your bottom line will give you a thorough picture of how your business is performing in all areas. 5. Consult your people. What do they need to get a clearer picture of to help them do their job better. You may be surprised by the suggestions and ideas that your people provide and they will certainly appreciate being asked for their input. • Increased report processing efficiency across the business. You can say goodbye to double handling, look forward to less errors and can expect some tangible gains in productivity. • Accurate information available to you in real time. The availability of up to date data will help you to make better decisions in relation to the operation of your business. • A more efficient IT department that is no longer having to wrestle with systems that can’t talk to each other. One system makes it easier in so many ways. • Less obstacles to growing your business. The integrated accounting processes that one system allows means that, scaling up and expanding into new locations will be a simple process from an accounting and reporting viewpoint. • Potential for increased sales and better customer service standards. Your front line staff will appreciate the clarity that real time information brings and will be able to act with greater confidence when attending to client’s needs. At Acacia consulting services we can assist you to improve your management reporting systems to give you a clearer, timelier picture of all of your business opeartions. We can help you to tailor an integrated software system that will cater for your business’ specific needs and requirements.